Buruji Kashamu has been presented as the gubernatorial candidate of a faction of the Ogun state chapter of Peoples Democratic Party (PDP) party. This is coming even as the party’s leadership submitted the name of Ladi Adebutu, Kashamu’s rival, to the Independent National Electoral Commission (INEC) as its candidate. 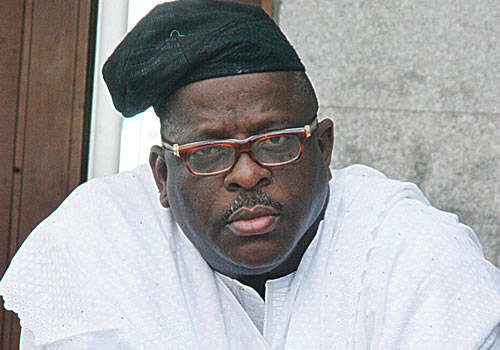 Kashamu had vowed to fight till the end. The faction, headed by Adebayo Dayo, presented Kashamu in the state today. Dayo said come what may, Kashamu would bear the flag of the opposition party in 2019, adding that he is the man who can wrestle power from the ruling party. “Today is the happiest day in my 40 years in politics. I have never seen any leader after the death of Obafemi Awolowo that is so important and famous and a good leader,” Dayo said. “Prince Buruji Kashamu is the man of the moment. Let anybody say whatever they like, prince Buruji Kashamu has been duly elected as the governorship candidate for 2019 election in Ogun state. His name is with INEC. “We have with him, all the elected senatorial candidates, we have the house of representatives candidates all present here today and we have the 36 members of the house of assembly candidates all present here today. “Today is a day we can never forget in the history of this town. We have never had it so good except when Baba Awolowo was alive. This is our own governor.